Content is more than simply what you say. It's also how you say it. We develop sites and apps the best way—from the ground up. When customers have questions, they want to talk to someone who gets it. We get it. Our mission is to create enriching, actionable experiences that motivate audiences to take the next step—while showing measurable ROI for our clients. At iostudio, we believe in empowering audiences through brand messaging. 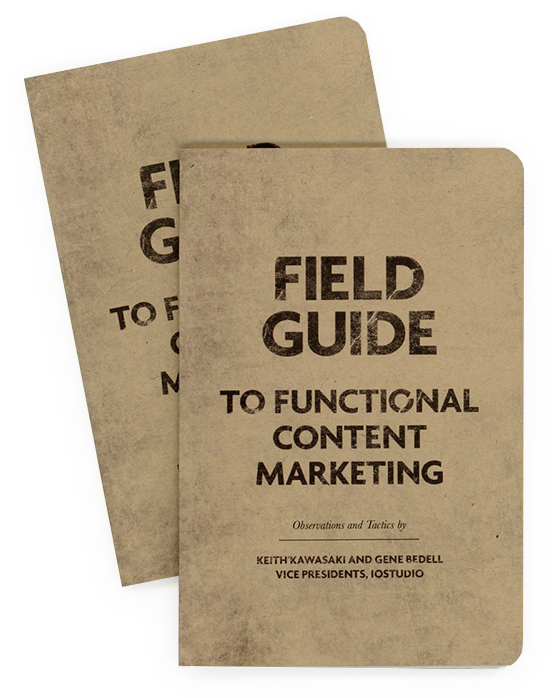 In the next several weeks, we'll cover our 13 tactics for functional content marketing in this series. Download the insights today! You can also request a hard copy of the Field Guide. Our central strategy is functional content marketing. Simply put, we create meaningful, actionable content that allows the target audience to take the next step. Functional content marketing is realized through audience and client research and integrates audience involvement, which ultimately delivers audience empowerment. This empowerment creates a magnetic experience that retains audience interest and attracts audience peer groups. When you think about your content, make more than an impression—build trust. From responsive websites to mobile solutions, we can support all of your technology needs. We take a holistic approach when engaging with audiences, meeting them where they want to be met.